This piece focuses on five golfers projected to have less than 5% ownership in large-field guaranteed prize pools, such as the massive Millionaire Maker on DraftKings. 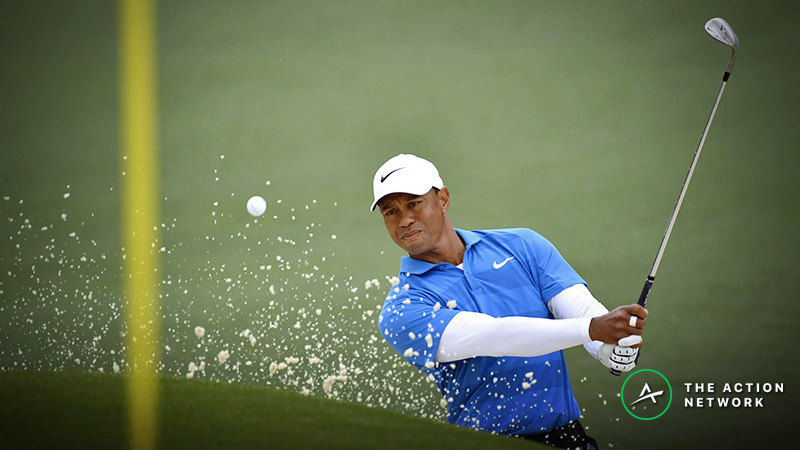 For more information on the Masters, check out CSURAM88’s 2019 Masters Model Preview and Justin Bailey’s DFS golf tips for first-time players. Also, be sure to utilize all of the amazing features in the FantasyLabs PGA Models. Justin Thomas & Jason Day: What Should We Expect for Their Ownership? It’s unlikely that either of these golfers will have less than 5% ownership, but it’s worth pointing out that, if you’re planning on playing the ownership game this week, both Justin Thomas ($10,200) and Jason Day ($9,100) are likely to have low ownership among golfers with DraftKings salaries of at least $9,000. Chalk it up to recency bias for Thomas: His last two events have ended with finishes of 35th and 30th, and his 68.5 Recent Adjusted Round Score (Adj Rd Score) is nearly a full shot higher than his Long-Term (LT) Adj Rd Score. Additionally, JT’s iron play has been somewhat lackluster: His 62.5 Recent Greens in Regulation (GIR) percentage is tied for 38th in the field. The fact that Thomas hasn’t had any top-10 finishes at Augusta National has also been thrown around the industry this week, but his 68.3 Course Adj Rd Score is tied for 15th in the field, and he has improved his finishing position in each of the past three years. Day, of course, is the mega-tilting, mid-round-withdrawing nightmare that DFS players wake up in a cold sweat thinking about. But other than his withdrawal at the Arnold Palmer Invitational and missed cut at the Valspar, he has not finished worse than 13th this season in any stroke-play event, and he has two top-five finishes in a limited number of events. His 62.1 LT Scrambling (SC) percentage is tied for ninth in the field and should help keep him in contention this week. Here are the five golfers I think provide the most bang for the buck when projected ownership is taken into account. You may not remember that Cam Smith ($7,400) finished fifth at Augusta last year, and although he arrives in shaky form — his 70.6 Recent Adj Rd Score places him in the bottom third of the field — the young Aussie has certainly flashed at points this season. Smith’s 69.3 LT Adj Rd Score, 61.5 LT SC percentage and 14.3 LT Adj Bird Avg; 2018 Australian PGA Championship victory; and last year’s fifth-place Masters finish are a few reasons why Hump thinks Smith could recapture some form at a track where course history may be more important than it is anywhere else on the PGA Tour. Matthew Fitzpatrick ($7,300) arrives at Augusta tied with the sixth-best Recent Adj Rd Score (67.5) in the field. The young Englishman’s 65.2 Recent SC percentage and 16.5 Recent Adjusted Birdies Per Tournament (Adj Bird Avg) both sit firmly inside the top 15. If you’re into Strokes Gained data, you should know that Fitz has gained stokes on Approach in seven of his past 11 rounds played. Plus, Fitzpatrick has a seventh-place finish under his belt at The Masters, where his 68.7 Course Adj Rd Score ranks 19th among golfers with at least three starts at Augusta. Martin Kaymer ($6,800) has won both the US Open (2014) and PGA Championship (2010), and he’s shown some recent signs of life as evidenced by his 69.5 Recent Adj Rd Score. After struggling through a horrific stretch of missed cuts in 2018, Kaymer has made the cut in five straight events and nine of his past 10. He also boasts a manageable history at Augusta, where he has made the cut in six of the past seven years. Kaymer has posted an impressive +8.49 Plus/Minus on average in his past four events. One of Hump’s favorite personalities on Tour, Kiradech Aphibarnrat ($6,700) has a knack for showing up in big events. Since March of last year, Aphibarnrat has notched three consecutive top-five finishes in WGC events, placed 15th in the US Open and finished 44th at Augusta. Moreover, in 2016, Kiradech ended his week at The Masters in 15th, so he’s proven he can get around this track. At his modest price tag he allows you to roster more than one high-end golfer. Adam Long ($6,400) shocked the golf world earlier this season when he won the Desert Classic as a 500-1 longshot. Since that time, he has sandwiched seven missed cuts and/or MDFs around a 10th-place finish at the Arnold Palmer Invitational. He is clearly an all-or-nothing option and could easily miss the cut. But in a short field like this, he could be the golfer who distinguishes an otherwise chalky lineup in a huge GPP like the Milly Maker. Long’s 9.5 Adj Bird Avg is extremely concerning, but his 69.7 Recent Adj Rd Score is certainly respectable. Good luck, and be sure to check out The Action Network if you’re looking for more Masters coverage!